This chapter deals with the peroxidase-catalyzed polymerization of phenol and its derivatives. Such a polymerization needs an oxidation reagent, normally hydrogen peroxide. Since this type of polymerization is believed to be a potential environmentally friendly alternative process for the production of phenol--formaldehyde resins, it has been investigated thoroughly by many research groups. 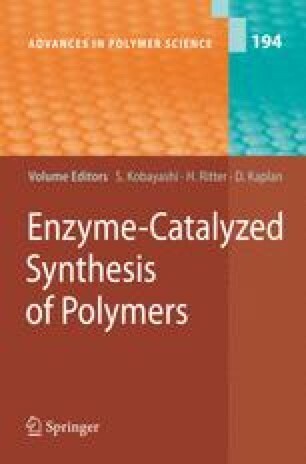 Typical research challenges in this field are investigations regarding the polymerization mechanism, the mechanism of enzyme catalysis, the structure of the resulting phenol polymers, and, needless to say, the synthesis of new materials. A comprehensive overview is given that covers the progress made during recent years, starting from the synthesis of simple resins obtained from unsubstituted phenol and leading up to the production of polyaromatic materials having multiple reactive groups in the side chain. One key for successful work in this field is to understand the characteristics of the enzyme. However, it is also important to be familiar with the influences of different solvents and various concentrations of the reactants (monomer, enzyme, hydrogen peroxide) on the yield, molecular weight, and structure of the resulting polymers. In other words, peroxidase-catalyzed polymerization is an interdisciplinary area covering different fields, mainly biochemistry, organic chemistry, and polymer chemistry for the synthesis of phenol polymers, as well as physical chemistry to understand their properties. This chapter tries to emphasize this aspect.